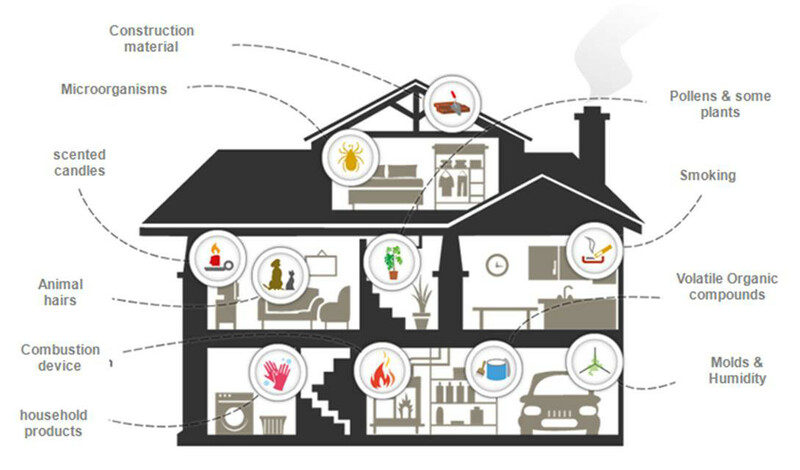 What are the different indoor pollutants? Indoor air (at home as well as in offices) is highly polluted: 5 to 10 times more polluted than outdoor air. But the indoor pollutants are very different from the outdoor pollutants. The vast majority of such particulate matter is produced outside, and it enters into homes with the fresh air, through windows, doors, HVAC systems, etc. Moreover, our activities generate numerous particulate matter (cigarette smoke, candles, cooking fat, abrasion of clothes on the skin, …). Also, we transport particulate matter through our clothes. For instance, if you spend even a short time in a room full of smoke, your clothes will absorb the particulate matter and will release them over many days: you will “smell like smoke”. These particulate matter are ranked by size, expressed in microns: less than 10 µm, less than 2.5 µm, less than 1 µm. Indoor air contains a wide number of chemical pollutants: all the solvents “dry” and their molecules fly in the air ; all scents fly in the air also. The molecules are called Volatile Organic Compounds (VOCs) or Polycyclic aromatic hydrocarbons (PAHs). Such molecules are present in numerous daily products: cleaning products, paint, glue, polish, perfumes, etc. Even natural products release VOCs, for instance the wood emits Terpen. Humans and pets emit VOCs also, for instance through sweat. Sometimes, such molecules trigger allergies. Consequently, indoor air contains hundreds of different molecules, which have various impacts in terms of smell or health effect. The molecules can sometimes recombine, and enhance the effect each of another: this is called the “cocktail effect“. Microbs (virus, bacteria, spores) are numerous in closed spaces, but most of the time, they are harmless, or even useful to train our immune defense. But some of them are irritating (flu, etc.) or even very dangerous. Most microbs stick on surfaces, but they may be present in air: an ill person will send a flow of microbs when coughing or even when breathing. Some spores or bacteria are so light and wide that they can fly with tiny air movement. Spores often trigger asthma crisis or allergies crises, and even increase the risk to develop asthma.